“The Hill” is a steep, woodland slope at the corner of Nelson Street and College Parkway in Rockville, Maryland. The Garden Club of College Gardens (GCCG) has landscaped and maintained a garden there since the 1970s. The Club is part of the National Capital Area Garden Clubs, Inc. and draws its approximately fifty-three members from residents of the surrounding neighborhoods. The Club meets monthly at the Rockville Senior Center to discuss gardening-related topics. In 2007, to address ongoing structural problems with “The Hill” garden, the Club spent hundreds of hours redesigning the hill and raising money to hire a landscape architect and contractor. “The Hill” is the property of the City of Rockville, so the Club worked in partnership with City officials and community residents to determine what lasting improvements could be made to the site. In order to fund the improvements, community members donated items for a community yard sale, held a raffle, offered their homes to be shown on a “renovation tour”, placed orders for the Club’s fall and spring plant sales, and made direct financial contributions to the project. Successful fundraising enabled the installation of new retaining walls, a new bench, and a plant bed of native ground covers and evergreen ferns. Plants in the garden include 'Wintergreen' boxwood, willowleaf cotoneaster, Oregon grape, doublefile viburnum, red astilbe, bleeding heart, purple coneflower, sweet woodruff, Lenten rose, black-eyed Susan, dwarf fountain grass, 'Little Bunny' fountain grass, autumn fern, cinnamon fern, painted fern, St. John’s wort, and liriope. The City of Rockville put in a water line for the site to ease maintenance requirements. Club members maintain the garden throughout the seasons by raking, watering, pruning, and planting bulbs. 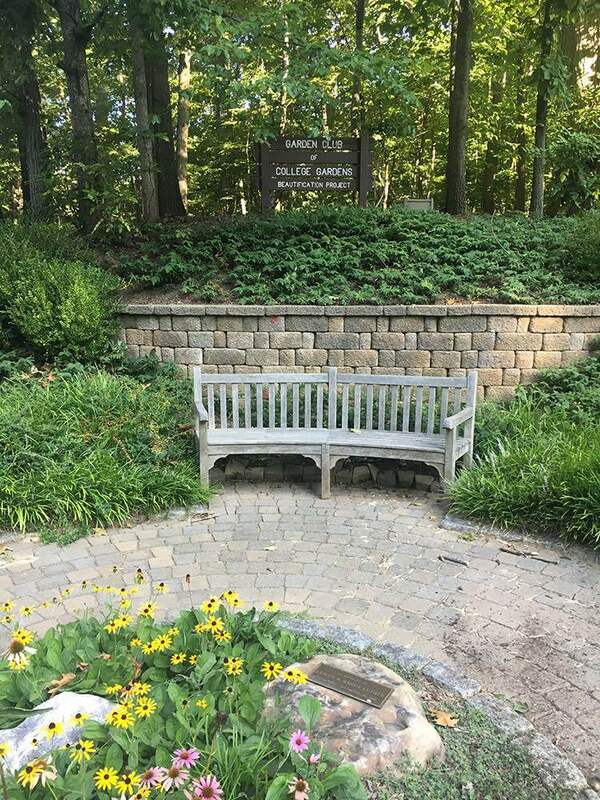 Since its update in 2007 the garden has received many daily visits from neighbors who enjoy a quiet moment on the bench or simply take in the beauty of the garden as they pass by on their way to work or one of the nearby parks. It has become a place where people come to meditate, read books, draw, rest from a dog walk, take a break from a bike ride, or park a stroller to grab a peaceful moment. Around Christmas this past year it became a hang-out for several teddy bears in sweaters that would come and go each day. For my part, I first encountered “The Hill” in 2009 when I was housesitting a few doors down, caring for our six-month-old while my husband worked in D.C. As a new resident with a small child, I took joy in the bench by “The Hill,” resting there with my baby while I took her to and from the Woodley Gardens playground. The garden reminded me of my parents' garden in the town where I grew up and I took comfort in knowing that people in this neighborhood wanted to create beauty and a sense of community for one another. We now own that same house and I enjoy taking my two daughters and two dogs past “The Hill” each day and take great pleasure in knowing that I am now part of the Garden Club that created this wonderful space. A relaxing bench in "The Hill"